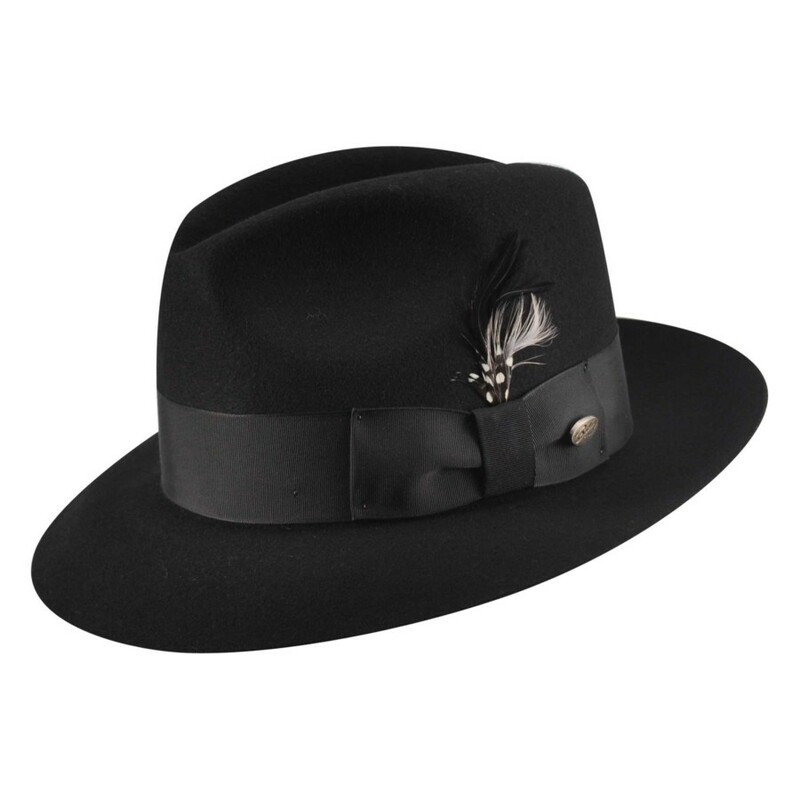 Channel the mafia's glory days with this Capone-style felt dress hat. 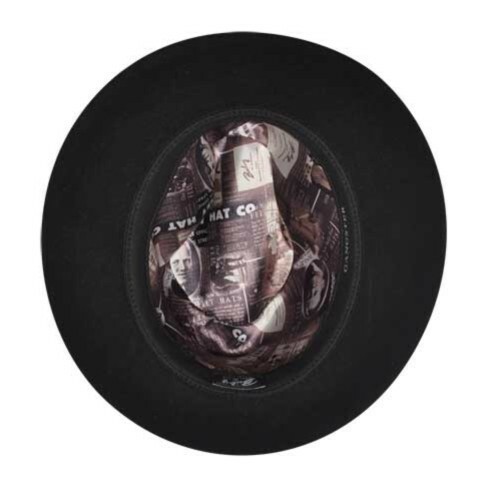 You'll feel like a prohibition-era lawbreaker with the hat's 2 1/2-inch snap brim, 5-inch crown, raw edge, feather accent, and wide grosgrain band and bow. As a fully lined hat with a 100% virgin wool exterior, this quality hat delivers superior style good enough for the likes of Al Capone, Bugsy Siegal, and John Dillinger. This fedora is a fantastic interpretation of the classic gangster hat. I just wanted to let you know, that (in addition to receiving a multitude of compliments on the hat) I used it yesterday on the filming of West Wing. We were filming a shot with Alan Alda getting out of a car and going to a meeting in cold blustery Chicago. It was well received and fit perfectly with the situation. I will be ordering some more soon. gangster style capone hat Review by John Smaldone Jr. I received the 2 hats I had ordered in the mail today. I was very surprised by the quick delivery. I had purchased a Stetson from you last year and being a hard-core Stetson fan I had my doubts about the Bailey Gangster fedora. Let me tell you that I love my new Bailey. I will only shop at the Fedora Store from this point on because of your quality costumer service and your quality products. I just received my hat via Fedex. I am extremely pleased. I have been looking for a hat at various stores, and have been unsuccessful in finding what I wanted. I found your website via Google and was so impressed by the site and the value that I purchased a Bailey Gangster in black immediately. I love it. I received it at work, so my wife has not seen it yet, but both my secretaries love it. Wow, what service!!! As per our phone discussion, I steamed the hat brim and molded it into the shape I wanted. It was pretty easy, and worked well. The hat looks great. I recelty purchaced the Gangster Fedora and I am very pleased with my choice. The fit of this hat, as well as the ease in shaping the brim exactly how I wanted it is more in line with a hat of much higher cost. 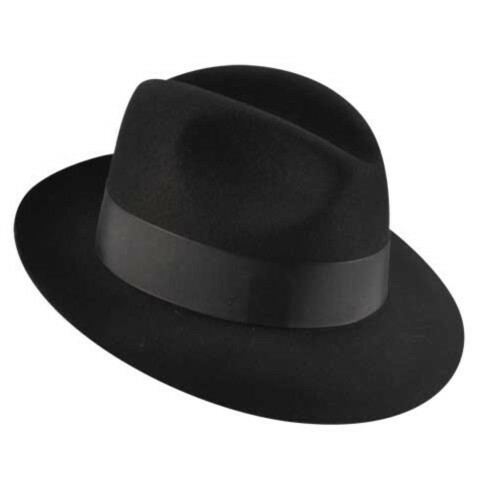 I ordered the Fedora Gangster hat in black on Friday week before Christmas for her husband as a Christmas gift. The hat was received the Thursday before Christmas, received within four business days. 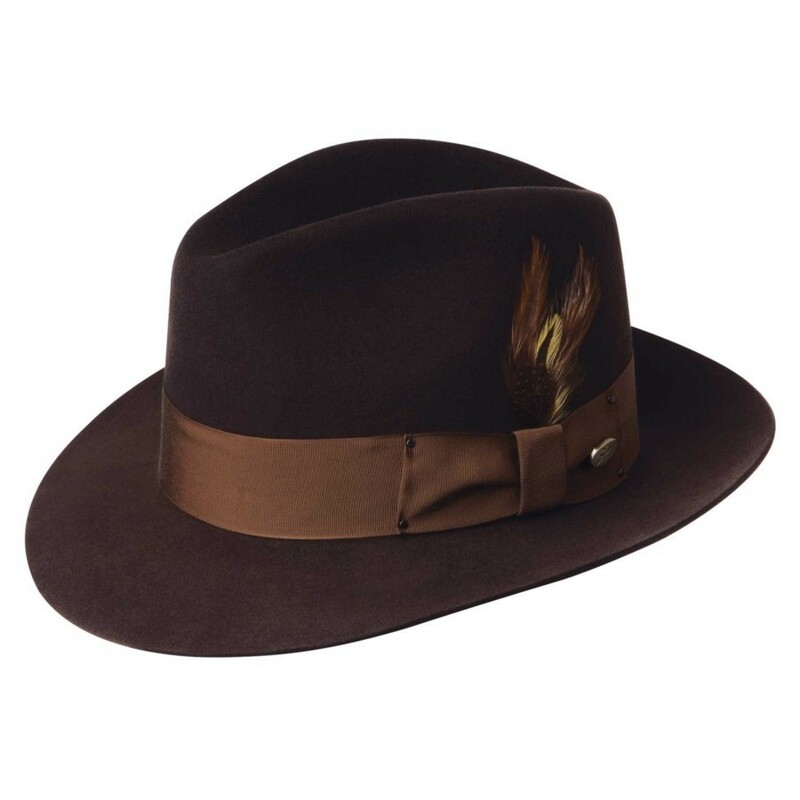 We are so pleased with the service and quality and how wonderful the hat looks that we would never hesitate to recommend The Fedora Store to anyone interested in purchasing a hat. My son-in-law is so very pleased with the hat and has already had several compliments on it. Thank you so very much. I could not be more impressed with the color and quality of my new hat......ordered it on a Monday night and received it Friday afternoon! That's fast!!! !